"It's a good time to escape." With the big football game this weekend, Warner Bros has debuted a new TV spot for Steven Spielberg's Ready Player One. Don't forget this movie is due out in theaters in just a few months, so there's not much of a wait now. The new preview also includes a hidden secret QR code which links to a hidden video that is narrated by Spielberg and author Ernest Cline, with some unseen footage. The more we see from this, the more excited I get. Young actor Tye Sheridan stars as Wade Watts, known in the Oasis gaming world as "Parzival". The full cast includes Mark Rylance as the game's creator, James Halliday, as well as T.J. Miller, Ben Mendelsohn, Simon Pegg, Olivia Cooke, Lena Waithe, Letitia Wright, and Kae Alexander. You can watch the newest TV spot below, and also check out the featurette. You can still see the Comic-Con teaser trailer for Ready Player One here, or the first full-length trailer here. When the creator of an MMO called the Oasis dies, he releases a video in which he challenges all Oasis users to find his Easter Egg, which will give the finder his fortune. Wade Watts finds the first clue and starts a race for the Egg. 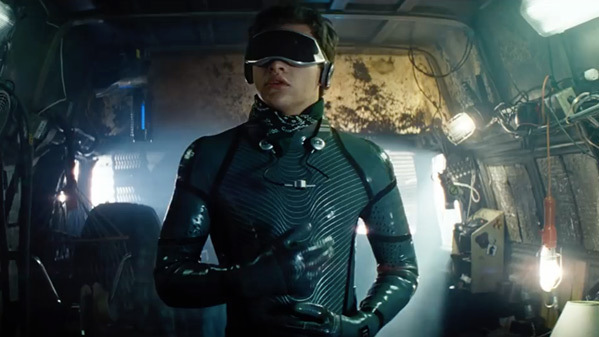 Ready Player One is directed by the one-and-only Steven Spielberg, of Jaws, Close Encounters of the Third Kind, the Indiana Jones movies, E.T., Empire of the Sun, Hook, the Jurassic Park movies, Schindler's List, Saving Private Ryan, A.I., Minority Report, War of the Worlds, Munich, War Horse, Lincoln, Bridge of Spies, and The BFG previously. The screenplay is written by Zak Penn, Eric Eason, and Ernie Cline; based on the novel of the same name by Ernie Cline. Warner Bros opens Spielberg's Ready Player One in theaters everywhere starting on March 30th, 2018 this spring. What do you think?